What do you do with your digital photographs? I’ve been wondering what to do with mine. Up until May this year, they have just been sitting in my computer with the odd one getting an outing onto Twitter or Flickr. I feel I’ve got to a standard now where I’m not embarrassed to let people see them (well, some of them). What I’d like is a physical output. One that’s real, not digital. I’ve looked into exhibiting but that’s expensive with no guarantees of sales to cover costs. There never is, but especially as I’m a relative newcomer. I was lucky enough to get my photo selected for the Royal Scottish Academy open exhibition this year but that is just one image to get printed and framed so it’s do-able. It sold ….. it really did!! Prints can be sold on line but I think these can be few and far between and I don’t have a printer (more expense). Getting work published in magazines is another route and one I’ve pursued. I don’t agree with photo competitions that are run commercially so they are out. I’m not really trying to make money from my digital photography, though that would be very nice, but I am wanting my photographs to be seen off a screen and if possible handled. 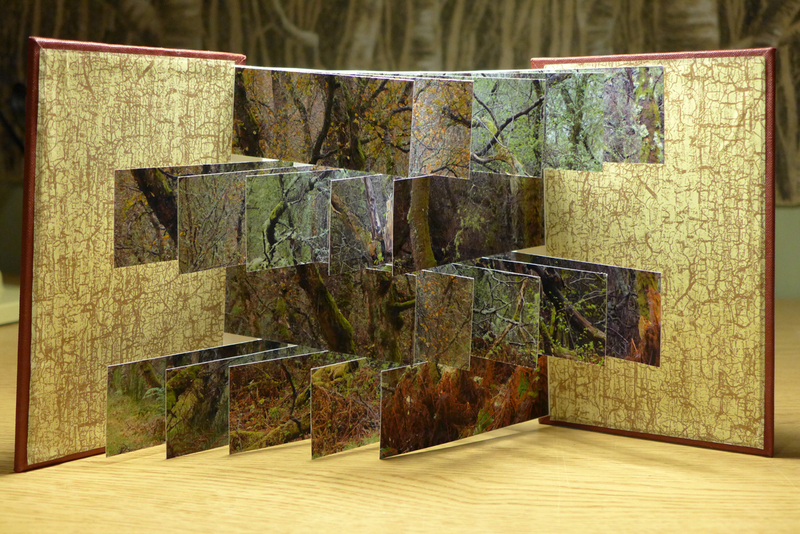 So…… I went on a bookbinding course with the specific aim of producing artists books for my photographs and drawings. They’re fantastic things. There’s so much scope to produce something truly unique. It can take the form of a more traditional book, or as in my photo of ‘one I made earlier’, you can move away from the traditional format. This one is made up of 3 of my A4 photos and is a deconstructed version of the woodland near my house. A bit fiddly to make but not very complicated. It closes like a normal book, and when you open it out the photographs spread open. I’ve still got some way to go to perfect making artists books but I’m really enjoying the learning process, and it gets my photos out of the computer and into the real world.